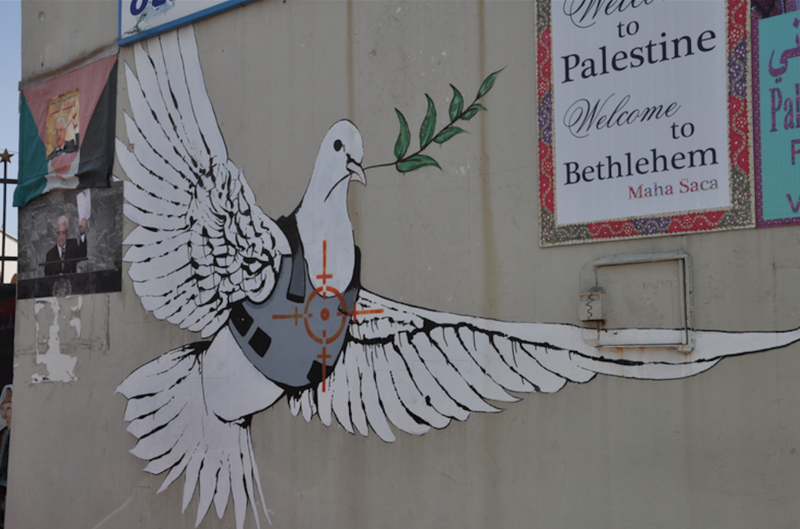 "Armored Dove" located on a building in Bethlehem. Still is considered one of the 9 politically powerful artworks by Banksy. BEVERLY HILLS—Two political artworks by one of the world’s famous pseudonymous street artists, Banksy, will be up for sale at Julien’s Auctions September 30. The murals are depicted on slabs of stonewall from Detroit, Michigan and the West Bank city of Bethlehem. “I Remember When All This Was Trees” is a 7×7 foot mural that was painted on the wall of the Packard factory in Detroit back in 2010. It is currently owned by a non-profit organization in Detroit, the 555 Gallery, who hopes to raise money for community programs with its sale. The second mural, which was painted in 2007, is titled, “Donkey Documents.” It is 7 feet in height and 10 ½ feet in length and was painted in Bethlehem, as part of a series of nine political paintings. The mural depicts a donkey handing over his papers to an armed soldier. It is also stated that “I Remember When All This Was Trees” is expected to bring in $400,000 to $600,000, which brings the estimated revenue between both artworks to over $1 million. Banksy’s work is known over the world, as he has art has been displayed in the United States, England, Australia, Israel, Canada and Jamaica. He began his career in the early 1990s on the streets of Bristol, England and later relocated to London by the early 2000s. 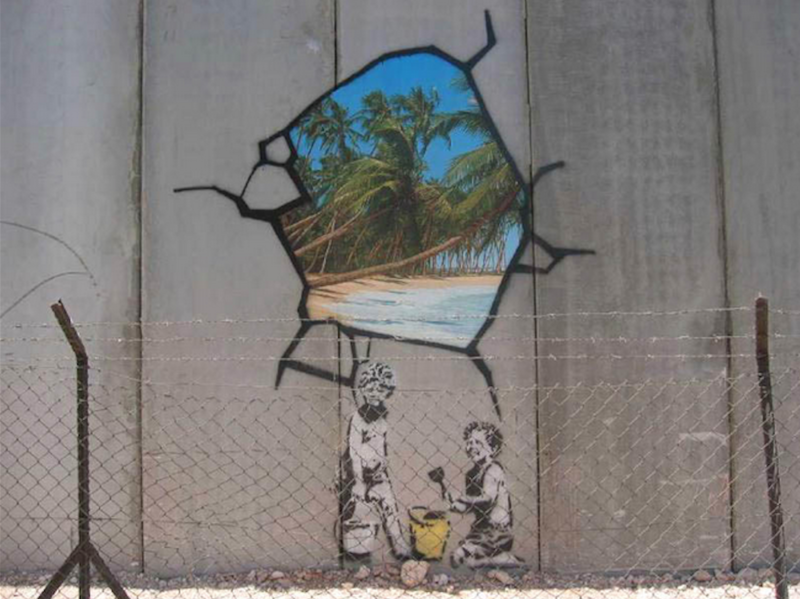 Banksy traveled to Palestine and then the West Bank, where his satirical messages rang around the world. 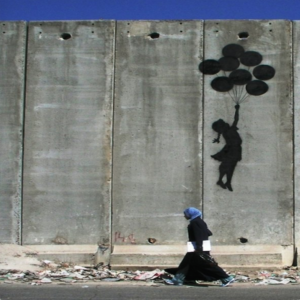 His most notable work was his collection of nine pieces scattered across various Palestinian and Israel walls. “The detached mural… is the largest and most significant intact Banksy mural in existence from his visit to Israel,” said Julien’s in a report by BBC News. Banksy’s key mediums throughout the past two decades have been stencils and silkscreen prints. Spray paint and permanent city fixtures, such as walls, sidewalks and even manholes, are often used as the vehicle for his messages. This renegade technique aligns with the subversive nature of Banksy’s art. Many other artists and fans consider Banksy the founder of a newly invigorated technique of pop art. He is often likened to Andy Warhol with his incorporation of culture and media, that he brings it to the streets. For more information on how to register to bid for a piece of Banksy’s artwork, visit the 2015 Street Art Auction event page, or call Julien’s Auctions at (310) 836-1818. Next article“The Bold And The Beautiful” Stunning Twist!